I really didn't know what to expect with this movie as I hadn't seen any shorts, and we decided to watch it on a whim influenced by cheap tickets. Based on the poster I decided it was your typical disaster movie with usual bad script, ham acting and no plot, so imagine my surprise to see Aaron Eckhart front and centre. 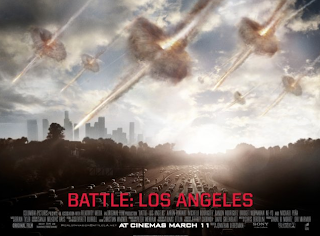 As it turns out, Battle Los Angeles is actually an alien invasion movie. It's kind of like what you'd get if you crossed Men in Black with Black Hawk Down, because apart from the main storyline of aliens trying to take over Earth, there was a sub-plot involving battle-worn Marine Sargeant Michael Nantz (Eckhart) having to win the trust of a new crew, and a theme of heroes versus heroics. All in all I thought it was a decent movie. Nothing spectacular apart from the effects, but still there was actually a plot, which is a step up from many of these big flicks. Verdict: a great date movie for teenagers. Interesting. 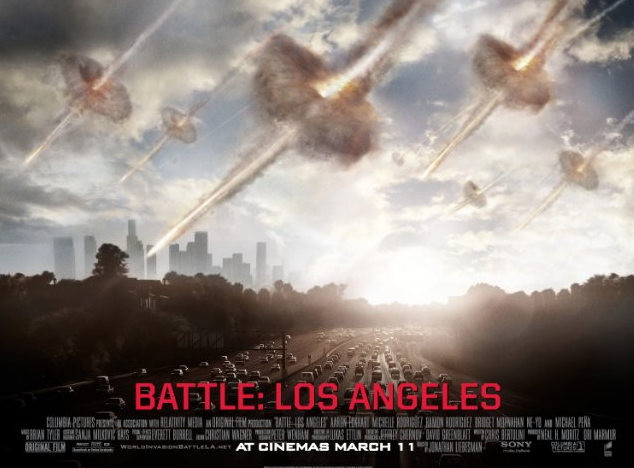 I'd kinda pegged it as a cross between District 9 and Cloverfield.